The 2011 Iditarod is down to the last 200 miles, where it *really* gets interesting, and DeeDee Jonrowe is now running 8th, about four hours behind the leader. 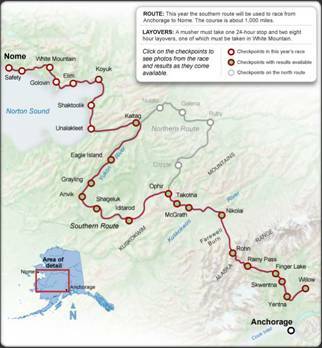 There are twelve mushers who have made it to Kaltag (see map), and five are on their way to Unalakleet. DeeDee is running 11 dogs, which is par for the course at this stage of the race. If you want to hope, the Iditarodblog noted the following about DeeDee: “If you’re checking the GPS Trackers you may notice that Dee Dee Jonrowe has posted some of the fastest run times. She seems to have an incredible amount of speed left in her team at this point in the race.” Yes, we did notice this :) Yay. Well the next 24 hours should prove decisive, we’ll see how it all shakes out. Here are the current standings… stay tuned, and go DeeDee!